Browse sweet ways to ask each of your favorite ladies to join you at the altar. With the ring firmly on your finger – literally or figuratively – you’re likely beginning to think about who you’d like to include in your bridal party. Though we don’t recommend asking anyone officially until you’re about nine months from your big day, brainstorming is never a bad idea. When the time has come and you’re ready to pop the question, the traditional “just call them up and ask” method is perfectly fine. However, if you desire a method with a bit more creativity, jump on the newest in wedding trends and create a “proposal” for your closest girls! - Ply them with sweets. In gift giving, you cannot go wrong with supplying a friend with their favorite treats. Make up little boxes filled with the preferred snacks of your gal pals with a sweet note asking if they’ll be a “sweetie” and join your bridal party! This is great if your future ‘maids live farther away from you – simply ship them the box! - Personalized shot glasses. If your girls like to enjoy a night on the town, why not gather them at your place for a pregame and hand them all custom shot glasses with the words “Will you be my bridesmaid/maid of honor?” emblazoned on the side? Hopefully, each girl will notice the words at the same time, but it may be fun to watch some momentarily confused faces and the excitement of others! - Favorite jewelry items. Necklaces, bracelets, and earrings are favorites in this category. Either select one style that will unify your bridesmaids or seek out different pieces that have special meanings to you and each individual lady. Many stores that specialize in custom designs provide boxes with your question etched into the top. - Give ‘em the ol’ rom-com treatment. If you’re feeling particularly sentimental, each girl lives close by, and you know your gals have friendly neighbors, why not set up a proposal à la your favorite romantic comedies? Stand outside their window with a boom box playing their favorite song or make a series of posters reliving your friendship to flip through on their front porch. You can customize each proposal to fit your gals’ favorite movies! - Figurines created in their likeness. If you are particularly artistic, creating a rendering of each friend out of everyday art supplies is a sweet and interesting way to build your wedding party. Draw out a sketch of what they make look like on the day or create a paper doll version of each woman with the help of a kit. Your friends are sure to be impressed! - Custom wine labels. Design personalized wine labels with the phrase “Will you be my bridesmaid?” in delicate calligraphy online to print and stick on bottles of your girlfriends’ favorite drinks. The next time you travel to her home for a night in, suggest you sip from this interesting new brand you just happened upon, and insist she read the creative label that caught your attention! - Puzzle pieces. For those of you with friends who enjoy a good brainteaser, design a custom puzzle that spells out your message for her to complete. Simply suggest you have a game night and that it’s “been a while” since you’ve completed a puzzle. The game will get your brains going and end with a fun surprise for her. - An eclectic picture collage. A picture is indeed worth a thousand words, and this is particularly true for those who’ve been friends for a long time. If the two of you have always loved being in front of the camera, you likely have countless snapshots of your friendship. You can create a physical flip-book or photo album, or design one online to email to each girl. Your friends will love the heartfelt trip down memory lane as you look forward to the future with your love and your gals by your side. - A simple, heartfelt card. Sometimes it’s best to keep it simple. Create your own cards filled with sentiments and stories to send to each lady – they’ll enjoy the personal touches and it’s something they can keep forever. - Or a funny one. If your girlfriends love a good laugh – and, let’s face it: who doesn’t? – a funny card with jokes and hilarious memories from your shared past will tickle their funny bone and get them excited for a fun-filled wedding planning period! 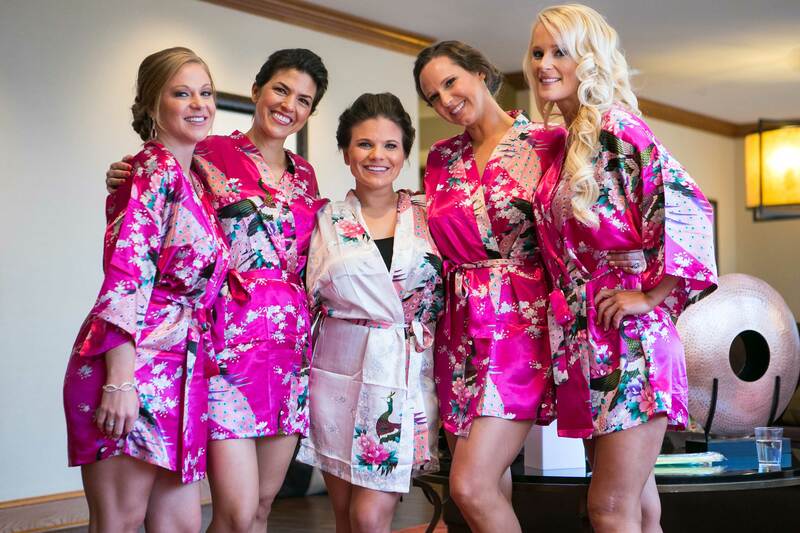 Read advice on what to expect from your bridesmaids and how to keep them happy, and flip through some gorgeous gown options for mismatched bridesmaids dresses.